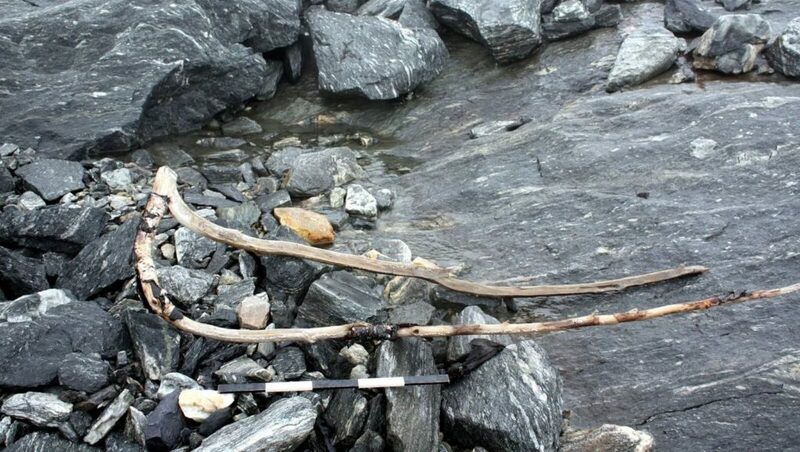 I remember shaking my head in disbelief when we found what looked like a giant wooden slingshot, melting out of the ice. When we discovered what the object really was, we got even more excited. It opened the door to a unknown prehistoric world of ice and snow. It was August 4th 2011, the year of the big melt. We were surveying along the upper edge of the Lendbreen ice patch. We started finding bits of textiles, leather and other objects that were unusual to discover on hunting sites. What was going on? While the rest of the crew started documenting the finds, Reidar and I continued further east along the ice edge. It was a foggy day, and the fog just got denser and denser as we progressed. Suddenly we stumbled upon a large wooden object. The large wooden object as it lay, close to the melting ice. Photo: Oppland County Council. The object is shown in more detail in the headline photo. It looked like a giant slingshot, more than a meter long. There was a hole in the “handle”, and the cutmarks from a knife were clearly visible. We had never seen anything like this before. What kind of object was it, and what was it doing at an altitude of nearly 2000 meters? Reidar and I looked at each other, shaking our heads. Little did we know that it was just the beginning. 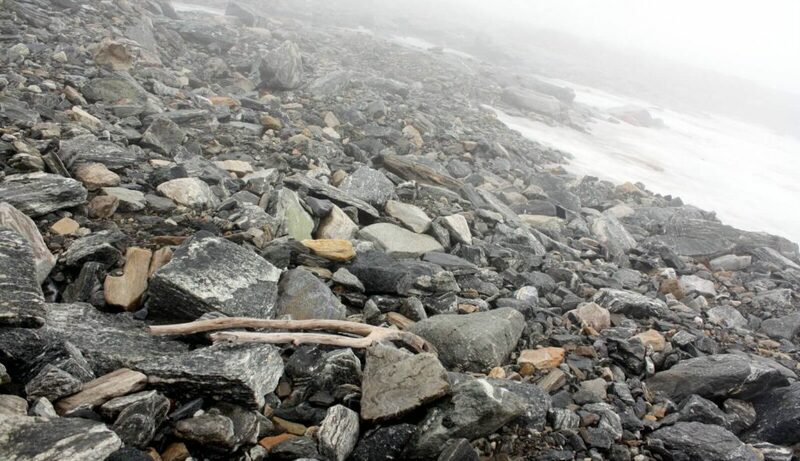 After walking just a few meters further, we found another large wooden object, similar to the first one. Bark was still attached to part of the wood. This one was even larger, close to 2 meters long. It was more slender and did not have a hole, where the arms met. The second large wooden object. Scale is 50 cm. Photo: Oppland County Council. Reidar and I did not get much time to ponder on these objects. The weather in the high mountains changes quickly, and suddenly the fog lifted. In front of us was a large and shallow depression in the mountain ridge. When we had been here the year before, the depression had been filled with snow and ice. The very warm summer of 2011 had melted all of this, and exposed the bare ground in the process. As we progressed into the depression, we had to be careful where we put our feet. The ground was littered with artefacts. I have never experienced anything like this as an archaeologist. We just stopped. I got the cell phone out of my inner pocket, and called the documentation team. I remember I had to focus on keeping my voice steady: “Guys, pack up your equipment and meet us in the basecamp. We need to talk.” It was the day we discovered the glaciated mountain pass at Lendbreen. 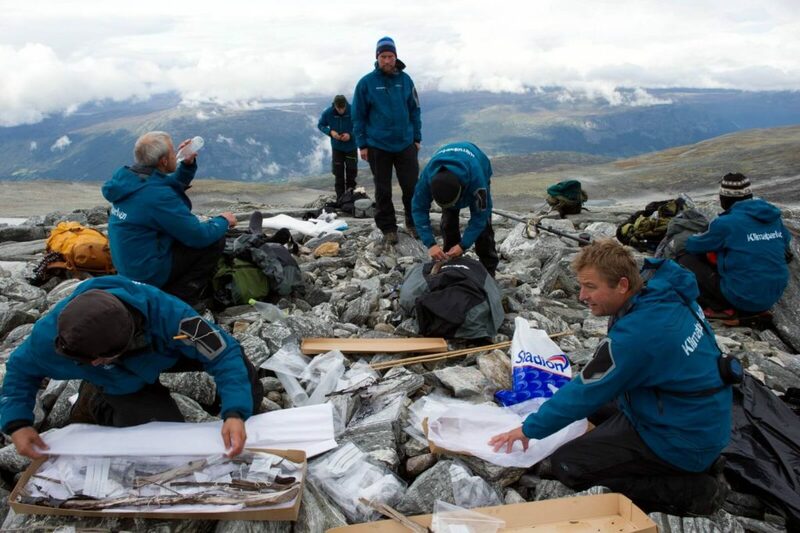 Members of the Secrets of the Ice team packing finds from the glaciated mountain pass at Lendbreen. Photo: Johan Wildhagen/Palookaville. In the next days we worked hard to rescue as many finds as possible, before the snow came. We noticed that there were several cairns close to the depression. It gradually dawned on us, that the depression was a mountain pass, and that many of the finds were associated with transport through the pass. We discovered iron horse shoes and horse dung, which showed that packhorses had gone through the pass. 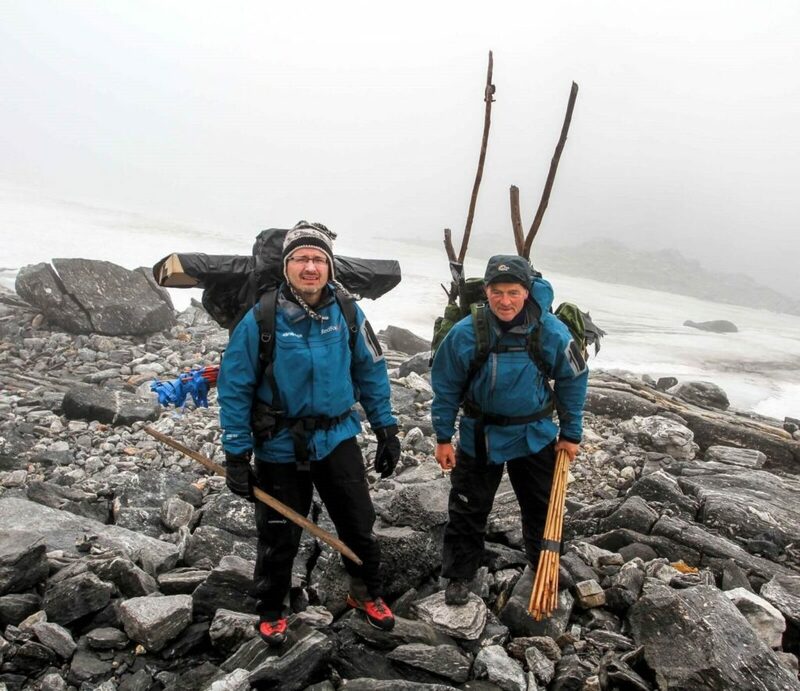 Reidar (right) and Lars getting ready to transport the two large wooden objects and other artefacts down to the basecamp. They are also carrying marker sticks for the finds. Photo: Espen Finstad, Oppland County Council. The two wooden objects were way too large for our finds boxes, so we had to improvise to get them down to the basecamp. The solution was to strap them to the outside of Reidar’s backpack, and walk down very carefully. Some days later, Jakop came up to the basecamp with his packhorses to transport equipment and finds down to the lowland. When we showed him the two large wooden objects, he immediately said: “I know what this is. It is called a tång.” He told us that they were used for strapping down the load on horsedrawn hay-sledges, which were used for transporting hay or leaf-fodder during the winter. Such hay-sledges had been in use locally until the 1950ies, when tractors became common. The local word tång translates into English as pliers. An early 20th century tång for strapping down hay on top of a sledge. The measuring stick is 1 m. Photo: Reidar Marstein. Reidar was able to find an early 20th century example of a tång from a local farm. Even though this object was a bit larger than the ones we had found, it was immediately obvious that Jakop was right. However, our objects were missing the piece connecting the arms. This would likely have been withe, rope or wood. How does a tång work? This is fairly straight-forward. The end with the hole is placed at the front of the sledge, on top of the hay. A rope, fastened in the hole, is pulled underneath the sledge and attached to the endpiece of the tång, between the two arms. The rope is then tightened, which makes the tång strap down the load. 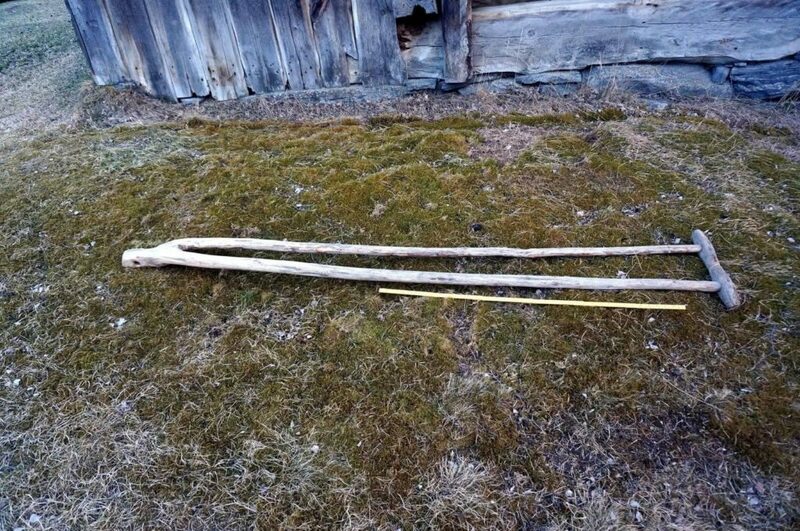 We have found hooks made in antler close to our tångs, and they may have played a part here. When we visited the Chinese Altai Mountains in 2016, we got a chance to see how the locals strapped down hay to a sledge for winter transport. The type of strapping object is a little different, but the idea is the same. Winter transport of hay in the Chinese Altai Mountains. It only remained to date the objects. We chose to date the first tång we found in the pass, as it was very similar in shape to the modern ones. By this time, we started to understand that the pass had been used for local transport to summer farms and perhaps also for long distance transport. But this would have been in the summer. The tångs were evidence of high altitude winter transport using sledges. When the radiocarbon date came back, we were in for a big surprise. The dated tång was from c. AD 400, deep into the Iron Age. We had no idea Iron Age people traveled through high altitude landscapes in the winter. Since then, we have also discovered Iron Age skis in the ice, confirming the presence of ancient humans at high altitude during winter. So no, the objects were not giant slingshots, they were something much better. They were proof that Iron Age humans ventured into the high mountains in the dead of winter. They brought horses and sledges along, into a prehistoric world of ice and snow. But were they transporting hay on the sledges at such an altitude during winter? And why were the tångs left behind in the pass? At present, we do not know. Maybe the answers to these questions are still waiting for us inside the ice.